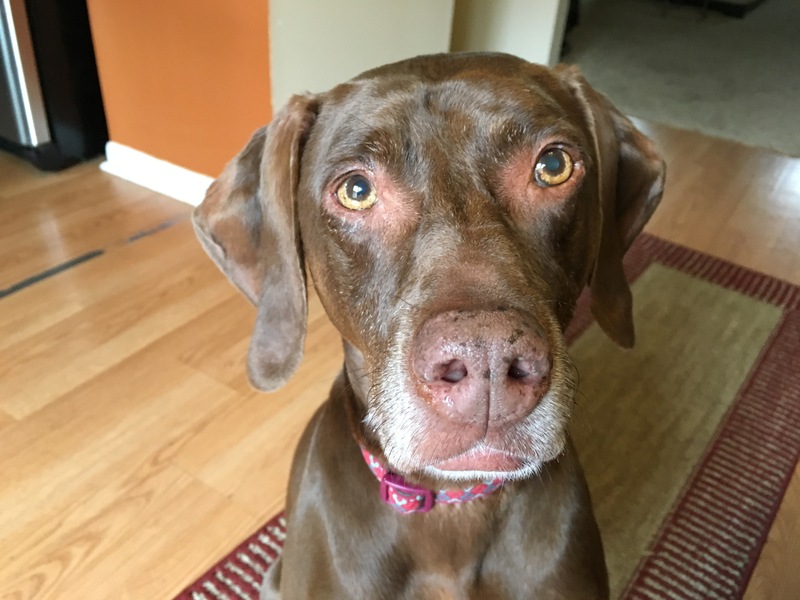 Maggie is a nine-year-old Weimaraner / Vizsla mix who lives in Omaha and was adopted a year ago. Her guardian is concerned that she may be suffering from Separation Anxiety; tearing things up in the house and scratching at the door when left alone. I always try to record my arrival for each session as the dog’s behavior gives me great insight into their personality, self perception and any issues they may have. That was certainly the case with Maggie. When a dog wants to show an appeasing or polite body posture, they often shift their ears back so that the inside of the ear faces forward. If the dog is really trying to appease or please it will round the ears on the side kind of like a C as well. Maggie gave almost the textbook definition of this ear posture when she met me at the door. Throughout the session I spotted a number of behaviors or body language that indicated to me that Maggie was a little bit unsettled. Her ears frequently flipped into the position that I outlined above and she often had her tail as far down as possible. I inquired as to how her guardian interacted with her whenever the dog was anxious or nervous. Many humans apply human psychology to dogs in these situations. Unfortunately applying human psychology here actually reinforces the problem. When a dog is in an excited, anxious, fearful or any other unbalanced state of mind and we pet them, we are reinforcing whatever state of mind the dog is in at the time. I strongly recommended that the guardian stop petting Maggie whenever she was in a similarly unbalanced state of mind and instead – try to distract her and get her moving forward. Dogs get over things by literally moving in a forward motion. So even if it’s just rolling a ball or throwing a favorite toy across the room, getting Maggie moving forward is the best course of action to employ when she is fearful or anxious. Another great way to help a dog improve it self-esteem is to reward it for engaging in what I like to call desired actions or behaviors. I spent the next few minutes going over a practice that I have developed called Petting with a purpose. By asking Maggie to sit or lay down before her guardian initially pets her, she will be able to help the dog feel good about engaging in these acts as well as develop and reinforce a healthy leader follower dynamic in the home. Whenever I have a client who’s dog has lower self-esteem, I always recommend that the guardians use YouTube to find a few different tricks or commands that they can teach their dog. Just like humans, dogs feel a sense of pride and accomplishment when they master a new skill. I recommended that Maggie’s guardian try to teach her a new trick every week for the next eight weeks. Because she suffers from Separation Anxiety, one of the first tricks I recommended she teach is the “stay” as this helps a dog develop self-control. Another great command to teach a dog is the recall. Because Maggie’s guardian is a grandmother, I spent the next few minutes going over how she can incorporate the grandchildren into teaching the dog to recall on command. We wrapped up the session by going over a new way of feeding Maggie that incorporates structure. Many dog guardians mistakenly assume that if their dog is anxious, the best course of action is to remove all rules and boundaries. But for a dog that is nervous, this can actually increase their anxiety. Dogs go through life probing waiting to be corrected or rewarded. If we don’t have any rules or structure in place, this can give the dog a false sense of authority. Just like with humans, dogs feel more stressed as their level of responsibility increases. By incorporating some simple rules and boundaries and enforcing them in a timely manner, Maggie’s guardian will be able to help her dog transition into a follower mindset. Once the dog identifies as being in a follower position and has mastered the eight new tricks or commands, she should feel much more confident when being left at home alone. By the end of the session, Maggie seemed more relaxed and had stopped nudging and pawing at her guardian for attention. As her guardian continues to practice the techniques and exercises introduced in the session, she should see a noticeable improvement in Maggie’s overall behavior as well as a reduction in her anxiety when left alone.